Earlier this year in Chuck Wendig’s novel Aftermath, we learned the incredibly depressing story of what happened to Jar Jar Binks after the Star Wars prequels. 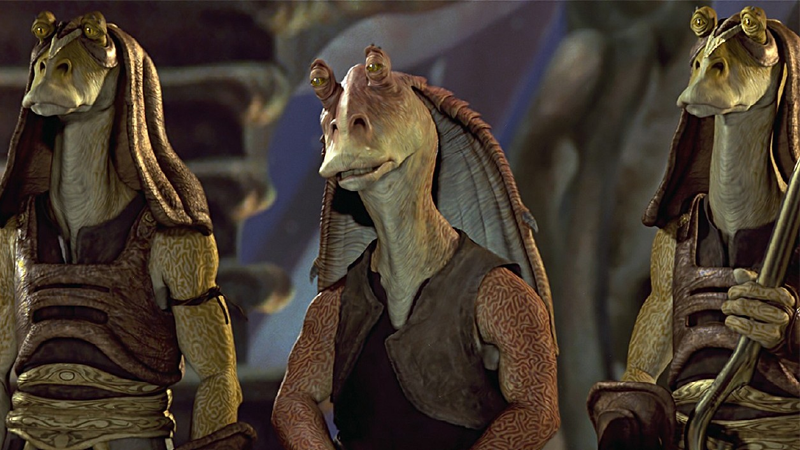 It was perhaps a fitting fate for a character so widely loathed, but Jar Jar actor Ahmed Best loves it—and actually wanted it to be even darker. Best has gone on record in the past with his desires for a darker edge to Jar Jar, a view tempered by years of having to live with the brutal reaction to the character after The Phantom Menace hit screens. So when the actor sat down with interviewer Jamie Stangroom for another chat about the life and times of the world’s most hated Gungan, Best had some thoughts about Jar Jar’s newly canonical existence as an incredibly sad clown. It’s a very somber, very dark eventuality for Jar Jar, I quite liked it actually! It was really dramatic and I think a good idea to kind of sum up. I always complained to George when I realised that Sith was pretty much not going to have Jar Jar in it and they were moving very very far from me, I always complained to George that I didn’t get a good death! I wanted to really be just hacked to pieces in some kind of way… and George wouldn’t do it. The interesting thing I think about Jar Jar is that everybody keeps looking for an explanation for him, which is human nature, a big part of my book will talk about this. I like all of these theories that try to explain the reasoning for Jar Jar, we talked about the Darth Jar Jar thing before, this one where he comes this tragic character where he realises he’s been manipulated and loses his mind. I think it’s cool, I think it’s interesting. It’s nice to see Best is happy with how the character eventually ended up, if only because it seems to mirror all the hurt he had to go through in the wake of Jar Jar’s introduction to the world. You can check out Stangroom’s full interview with Best—including Best’s thoughts on the new Star Wars films and his part in pioneering live-action portrayals of CG characters—at the link below.